In past posts, I have made it pretty clear that I have a love affair with dystopian novels. But I will admit that even I can’t get them all read as soon as they are released so sometimes I am late to the game. 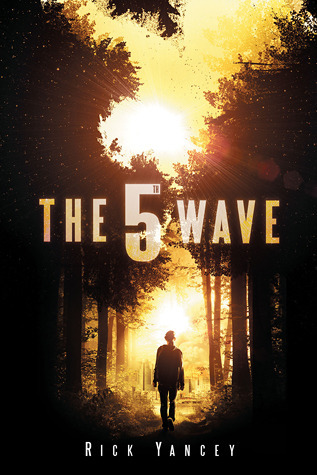 The 5th Wave is one of those cases…sort of. The 5th Wave by Rick Yancey is one of those books that I picked up multiple times but I just couldn’t bring myself to pay full price for it. The summary sounded interesting, but after reading so many dystopian novels they can all fade together, so I try to be selective about which I choose. But then of course the Powers That Be decided that it was time to bring the story to the big-screen, which automatically pushed the book to the top of my list. So after I happened to get my hands on a free copy (yeah, I got connections), I knew it was meant to be! The 5th Wave by Rick Yancey centers around Cassie Sullivan, a teenager living a normal life until the world is practically decimated by what is assumed to be alien invaders. The human population is taken out in the form of different waves of attack, each of which is of different strengths and executed in a different manner. Cassie is one of the very few humans that survives the first 4 waves. The story follows Cassie as she is not only trying to survive in this new dystopian environment but also trying to reconnect with her younger brother after he is taken away to what is believed to be a camp of survivors. At the same time, Cassie is dealing with a new found and complicated relationship with a mysterious guy that is hiding a dark secret. After going back and forth so many times about buying the book initially, I wasn’t sure how I would feel about the novel. Thankfully, I was very pleased with the outcome. To be honest, it has been a while since I had a book pull me in to the point of having to read it constantly. And The 5th Wave did that for me. Cassie wasn’t one of those annoying characters that focused on unimportant things and didn’t convey the expected sense of urgency to survive in this type of situation. She reacted the way that most people her age would really react to being dealt incredible circumstances. At the same time, you did not lose the sense that before the invasions she was just a normal girl dealing with things like having a crush on the most popular guy in school. That’s a hard balance to achieve and Yancey accomplished it. As far as the writing goes, I was satisfied in that aspect as well. Yancey did a great job writing the plot-line in a very intelligent manner. Even though the idea of an alien invasion is pretty far-fetched, Yancey was able to write in such a scientific manner that I found myself buying into the idea that this could happen (if there really is intelligent life out there somewhere). The idea that people could be walking around completely normal and then one day simply be awoken to become these other beings because aliens are implanted in them in uterine is pretty interesting. It poses a problem that is almost impossible to combat. Hence, the crux of the story. How do you fight unknown beings if they look just like you? This problem is what really makes me highly interested to continue the series and find out the conclusion. I haven’t started them yet, but you can bet the sequels, The Infinite Sea and The Last Star, are on my to-read list. The movie of the same name is also on my to-see list, although if you pay attention to the reviews, it shouldn’t be on my list. But who cares?? I am still going to see it. I am actually pretty excited to do a comparison review of the movie, so be on the lookout for that soon! And be sure to check out the reviews of the rest of this series that I will be doing in the near future. Ultimately, if you have not already read The 5th Wave, get on that ASAP! It’s definitely worth it! Have you read The 5th Wave? What did you think? Will you read the sequels? What about checking out the movie? This entry was posted in Dani, Reviews, Reviews: BOOKS and tagged book review, books, Dani, Reviews, rick yancey, the 5th wave. Bookmark the permalink. I didn’t realize this was part of a series. I look forward to reading what you have to say about the rest of the books.